Time to crack open the Rioja, get your best pot of saffron out and cook some of our seasonal peppers, pretending you’re on a Costa del Somewhere Else. Our long, wobbly romano peppers are great simply roasted in olive oil or stuffed with some of our Laverstoke mozzarella and pesto verde. It doesn’t claim to be the most authentic paella in the world, but try a warming and tasty chicken & chorizo dish using red peppers to share on a colder evening with friends, or instead of Sunday lunch. It’s great for using up some runner beans too. 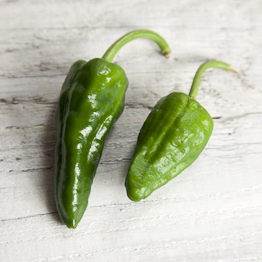 We’ve also got some new kids on the Riverford block in the form of our small and feisty padron peppers. Spanish tapas favourites (although they’ve been growing on our French farm in abundance), they’re easy to cook and will have you coming back for more. We made the traditional pimientos de padron, or try them stuffed with our High Weald sheep’s cheese, with a double dose of peppers in our red pepper and tomato dip. A Julio Iglesias soundtrack is optional. Salud! This entry was posted in Kirsty's cooking blog and tagged cooking, Kirsty hale, padron peppers, Ramiro peppers, recipes. Bookmark the permalink. I tried to print the chicken /chorizo recipe but the ingredients were overprinted with dots. The method is fine, any advice?